Whoa is right! 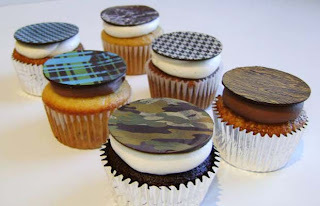 After reading this article in the Montreal Gazette titled 'Customers go wild for 'manly cupcakes'', and visiting the website of the bakery featured in the article, and drooling at my desk over the assortment of crazy flavoured cupcakes, I had to do a post. Just take a look at the menu (click it to view larger). Which do you want? And better yet, can you get drunk from a cupcake!? The rum & coke and the driller - maple cake topped with crumbled bacon and loaded with milk chocolate ganache, sound ridiculous! Bacon on a cupcake, ya I'll try it! And of course the s'more lover in me wants to try the Campout. Why oh why can only New Yorkers enjoy these treats!? The good news, well not for us Canadians, is they are expanding. Soon they'll open a storefront location, and the business which is only online right now, will eventually ship cupcakes across the U.S. I'm still hunting for the best cupcake in Toronto. Help me! Honestly...the best cupcakes in Toronto are at our friday night dinners! I saw this article a few months back - next time you're in NYC we'll order some! I want to try them too! just had a mint chocolate and lavender chocolate cupcake at FRESH on queen west at crawford - it was divine!!! i have tried just about every cupcake toronto has to offer and this one is the best !